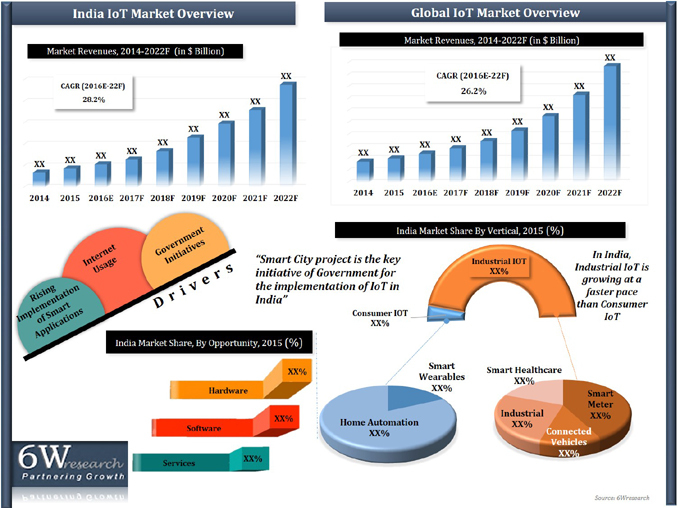 India Internet of Things (IoT) market in India is in the initial phase which is expected to grow exponentially over the next six years. The major drivers of this market in India are initiatives taken by the government, growing acceptance of smart applications, and increasing internet penetration across the country. Government of India launched various projects such as 100 smart cities project and organizations for the adoption and implementation of IoT. According to 6Wresearch, Internet of Things market in India is projected to grow at a CAGR of 28.2% during 2016-22. For the growth of the overall market, smart cities project is expected to play vital role. World Bank and Asian Development Bank (ADB) are anticipated to provide loans of $500 million and $1 billion respectively to India for the development of Smart City Project. Amongst all the applications, industrial application contributes maximum revenue share in Indian IoT market owing it growing usage in energy management, smart building, manufacturing, conserving energy and environment. Software expenditure towards Internet of Things market in India is expected to grow significantly on the back of advancements in data analytics & service and cloud hosting & managed services.